The Quiz Group meet on the 4th Thursday of each month, at The Central Methodist Church, at 10.00 for about 2 hours. 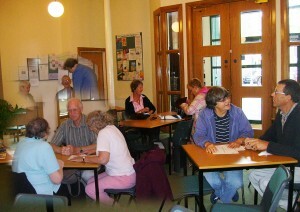 The Quizzes vary each month as they are set by individual members, there is no obligation to set a quiz. Each quiz compiler provides their own unique quiz, there is no set format. About 60 questions is the average quiz, 2 parts of 30 questions. We have a break for tea, coffee and biscuits in the middle. Various types of questions are posed –straight forward questions on any subject, picture questions, dingbats, audio questions about music, recognising peoples voices, recognising poems, local history, cryptic clues and any category the compiler chooses. We like variation. It is difficult but we try our best to make the quizzes not too hard or specialist. We do not have set teams. We place the names of members attending, on cards face down and pick random teams of 3\4\5 according to how many people have come. This allows everyone a chance to be on a winning team sometime throughout the year and lets people meet new members and make new friends. During the year we have a quiz where everyone brings 4 questions and we have a Combination Quiz which make for a Jacobs Join Quiz with questions not food!! Each person asks their own questions which can be linked on a theme or just random. We also have a quiz base on Trivial Pursuit Question cards. Members are encouraged to make suggestions for new and varied quizzes. We take it in turns to bring milk and 2 packs of biscuits each session. The charge for the Session is £2 to cover the rent of the room. This is reduced when we get a build up of funds if lots of members attend and occasionally there is a free week. We want members to enjoy the sessions and have fun as well as exercising their brains. We aim to know some answers, learn new information, swear blind we knew the answer once and that it is somewhere lurking in our failing memory. The fact that many of our members are long standing suggests that he Quiz Group is a fun and interesting pace to be on the 4th Thursday of each month. Not always a serious occasion.